"Royal purple" redirects here. For other uses, see Royal Purple (disambiguation). Not to be confused with byzantium (color), a modern colour. Tyrian purple (Ancient Greek: πορφύρα, porphúra; Latin: purpura), also known as Tyrian red, Phoenician purple, royal purple, imperial purple or imperial dye, is a reddish-purple natural dye. It is a secretion produced by several species of predatory sea snails in the family Muricidae, rock snails originally known by the name Murex. In ancient times, extracting this dye involved tens of thousands of snails and substantial labor, and as a result, the dye was highly valued. The main chemical is 6,6′-dibromoindigo. Tyrian purple may first have been used by the ancient Phoenicians as early as 1570 BCE. The dye was greatly prized in antiquity because the colour did not easily fade, but instead became brighter with weathering and sunlight. Its significance is such that the name Phoenicia means 'land of purple.' It came in various shades, the most prized being that of "blackish clotted blood". A twentieth-century depiction of a Roman triumph celebrated by Julius Caesar. Caesar, riding in the chariot, wears the solid Tyrian purple toga picta. In the foreground, two Roman magistrates are identified by their toga praetexta, white with a stripe of Tyrian purple. Some[who?] speculate that the dye extracted from the Bolinus brandaris is known as argaman (ארגמן) in Biblical Hebrew. Another dye extracted from a related sea snail, Hexaplex trunculus, produced a blue colour after light exposure which could be the one known as tekhelet (תְּכֵלֶת), used in garments worn for ritual purposes. The dye substance is a mucous secretion from the hypobranchial gland of one of several species of medium-sized predatory sea snails that are found in the eastern Mediterranean Sea. These are the marine gastropods Bolinus brandaris the spiny dye-murex (originally known as Murex brandaris Linnaeus, 1758), the banded dye-murex Hexaplex trunculus, the rock-shell Stramonita haemastoma, and less commonly a number of other species such as Bolinus cornutus. The dye is an organic compound of bromine (i.e., an organobromine compound), a class of compounds often found in algae and in some other sea life, but much more rarely found in the biology of land animals. In nature the snails use the secretion as part of their predatory behaviour in order to sedate prey and as an antimicrobial lining on egg masses. [b] The snail also secretes this substance when it is attacked by predators, or physically antagonized by humans (e.g., poked). Therefore, the dye can be collected either by "milking" the snails, which is more labour-intensive but is a renewable resource, or by collecting and destructively crushing the snails. David Jacoby remarks that "twelve thousand snails of Murex brandaris yield no more than 1.4 g of pure dye, enough to colour only the trim of a single garment." Many other species worldwide within the family Muricidae, for example Plicopurpura pansa, from the tropical eastern Pacific, and Plicopurpura patula from the Caribbean zone of the western Atlantic, can also produce a similar substance (which turns into an enduring purple dye when exposed to sunlight) and this ability has sometimes also been historically exploited by local inhabitants in the areas where these snails occur. (Some other predatory gastropods, such as some wentletraps in the family Epitoniidae, seem to also produce a similar substance, although this has not been studied or exploited commercially.) The dog whelk Nucella lapillus, from the North Atlantic, can also be used to produce red-purple and violet dyes. The Phoenicians also made an indigo dye, sometimes referred to as royal blue or hyacinth purple, which was made from a closely related species of marine snail. The Phoenicians established an ancillary production facility on the Iles Purpuraires at Mogador, in Morocco. The sea snail harvested at this western Moroccan dye production facility was Hexaplex trunculus (mentioned above) also known by the older name Murex trunculus. This second species of dye murex is found today on the Mediterranean and Atlantic coasts of Europe and Africa (Spain and Portugal, Morocco, and the Canary Islands). The most favourable season for taking these [shellfish] is after the rising of the Dog-star, or else before spring; for when they have once discharged their waxy secretion, their juices have no consistency: this, however, is a fact unknown in the dyers' workshops, although it is a point of primary importance. After it is taken, the vein [i.e. hypobranchial gland] is extracted, which we have previously spoken of, to which it is requisite to add salt, a sextarius [about 20 fl. oz.] about to every hundred pounds of juice. It is sufficient to leave them to steep for a period of three days, and no more, for the fresher they are, the greater virtue there is in the liquor. It is then set to boil in vessels of tin [or lead], and every hundred amphorae ought to be boiled down to five hundred pounds of dye, by the application of a moderate heat; for which purpose the vessel is placed at the end of a long funnel, which communicates with the furnace; while thus boiling, the liquor is skimmed from time to time, and with it the flesh, which necessarily adheres to the veins. About the tenth day, generally, the whole contents of the cauldron are in a liquefied state, upon which a fleece, from which the grease has been cleansed, is plunged into it by way of making trial; but until such time as the colour is found to satisfy the wishes of those preparing it, the liquor is still kept on the boil. The tint that inclines to red is looked upon as inferior to that which is of a blackish hue. The wool is left to lie in soak for five hours, and then, after carding it, it is thrown in again, until it has fully imbibed the colour. Archaeological data from Tyre indicate that the snails were collected in large vats and left to decompose. This produced a hideous stench that was actually mentioned by ancient authors. Not much is known about the subsequent steps, and the actual ancient method for mass-producing the two murex dyes has not yet been successfully reconstructed; this special "blackish clotted blood" colour, which was prized above all others, is believed to be achieved by double-dipping the cloth, once in the indigo dye of H. trunculus and once in the purple-red dye of B. brandaris. The Roman mythographer Julius Pollux, writing in the 2nd century CE, asserted (Onomasticon I, 45–49) that the purple dye was first discovered by the philosopher Heracles of Tyre, or rather, by his dog, whose mouth was stained purple from chewing on snails along the coast at Tyre. 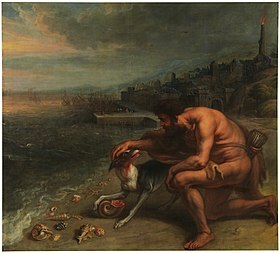 This story was depicted by Peter Paul Rubens in his painting Hercules' Dog Discovers Purple Dye. According to John Malalas, the incident happened during the reign of the legendary King Phoenix of Tyre, the eponymous progenitor of the Phoenicians, and it was therefore he that was the first ruler to wear Tyrian purple and legislate on its use. Recently, the archaeological discovery of substantial numbers of Murex shells on Crete suggests that the Minoans may have pioneered the extraction of Imperial purple centuries before the Tyrians. Dating from collocated pottery suggests the dye may have been produced during the Middle Minoan period in the 20th–18th century BCE. Accumulations of crushed murex shells from a hut at the site of Coppa Nevigata in southern Italy may indicate production of purple dye there from at least the 18th century BCE. The production of Murex purple for the Byzantine court came to an abrupt end with the sack of Constantinople in 1204, the critical episode of the Fourth Crusade. 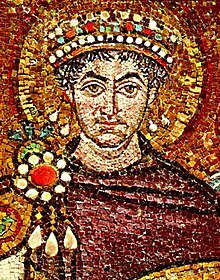 David Jacoby concludes that "no Byzantine emperor nor any Latin ruler in former Byzantine territories could muster the financial resources required for the pursuit of murex purple production. On the other hand, murex fishing and dyeing with genuine purple are attested for Egypt in the tenth to 13th centuries." By contrast, Jacoby finds that there are no mentions of purple fishing or dyeing, nor trade in the colorant in any Western source, even in the Frankish Levant. The European West turned instead to vermilion provided by the insect Kermes vermilio, known as grana, or crimson. In 1909, Harvard anthropologist Zelia Nuttall compiled an intensive comparative study on the historical production of the purple dye produced from the carnivorous murex snail, source of the royal purple dye valued higher than gold in the ancient Near East and ancient Mexico. Not only did the people of ancient Mexico use the same methods of production as the Phoenicians, they also valued murex-dyed cloth above all others, as it appeared in codices as the attire of nobility. "Nuttall noted that the Mexican murex-dyed cloth bore a "disagreeable … strong fishy smell, which appears to be as lasting as the color itself." Likewise, the ancient Egyptian Papyrus of Anastasi laments: "The hands of the dyer reek like rotting fish ..." So pervasive was this stench that the Talmud specifically granted women the right to divorce any husband who became a dyer after marriage. Murex purple was a very important industry in many Phoenician colonies and Carthage was no exception. Traces of this once very lucrative industry are still visible in many Punic sites such as Kerkouane, Zouchis, Djerba and even in Carthage itself. According to Pliny, Meninx (today's Djerba) produced the best purple in Africa which was also ranked second only after Tyre's. It was found also at Essaouira (Morocco). The Royal purple or Imperial purple was probably used until the time of Augustine of Hippo (354–430 CE) and before the demise of the Roman Empire. 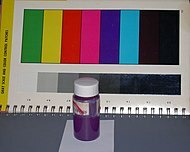 The main chemical constituent of the Tyrian dye was discovered by Paul Friedländer in 1909 to be 6,6′-dibromoindigo, derivative of indigo dye that had previously been synthesized in 1903. Unlike indigo, it has never been synthesized commercially. An efficient protocol for laboratry synthesis of dibromoindigo is developed in 2010. Variations in colors of "Tyrian purple" from different snails is related to indigo dye (blue) or 6-bromoindigo (purple) being present in addition to the red 6,6′-dibromoindigo. Additional changes in color can be induced by debromination from light exposure (as is the case for Tekhelet) or by heat processing. In 1998, through a lengthy trial and error process, an English engineer named John Edmonds rediscovered a process for dyeing with Tyrian purple. He researched recipes and observations of dyers from the 15th century to the 18th century. He explored the biotechnology process behind woad fermentation. After collaborating with a chemist, Edmonds hypothesized that an alkaline fermenting vat was necessary. He studied an incomplete ancient recipe for Tyrian purple recorded by Pliny the Elder. By altering the percentage of sea salt in the dye vat and adding potash, he was able to successfully dye wool a deep purple colour. Recent research in organic electronics has shown that Tyrian purple is an ambipolar organic semiconductor. Transistors and circuits based on this material can be produced from sublimed thin-films of the dye. The good semiconducting properties of the dye originate from strong intermolecular hydrogen bonding that reinforces pi stacking necessary for transport. The lower one is the sRGB colour #990024, intended for viewing on an output device with a gamma of 2.2 . It is a representation of RHS colour code 66A, which has been equated to "Tyrian red", a term which is often used as a synonym for Tyrian purple. The colour name "Tyrian plum" is popularly given to a British postage stamp that was prepared, but never released to the public, shortly before the death of King Edward VII in 1910. 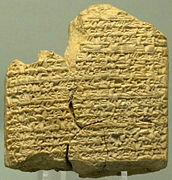 Cuneiform tablet, dated 600–500 BCE, with instructions for dyeing wool purple and blue. Ref.BM62788 . Painting of a man wearing an all-purple toga picta, from an Etruscan tomb (about 350 BCE). Roman men wearing togae praetextae with reddish-purple stripes during a religious procession (1st century BCE). 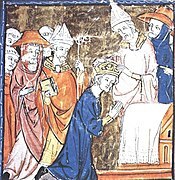 A medieval depiction of the coronation of the Emperor Charlemagne in 800 CE. The bishops and cardinals wear Tyrian purple, and the Pope wears white. A fragment of the shroud in which the Emperor Charlemagne was buried in 814 CE. It was made of gold and Tyrian purple from Constantinople. ^ It is also possible that the term porphyrogenitos may refer to the purple-red rock known as porphyry that walled the imperial birthing apartment. ^ Because of research by Benkendorff et al. (1999), the Tyrian purple precursor tyrindoleninone is being investigated as a potential antimicrobial agent with uses against multidrug resistant bacteria. ^ "Color Conversion Tool set to colour #66023C (Tyrian purple)". Forret. ^ Cunliffe, Barry (2008). Europe between the Oceans: 9000 BC-AD 1000. New Haven, CT: Yale University Press. p. 241. ^ "Phoenician". Online Etymology Dictionary. ^ a b "Pigments: Causes of Color". WebExhibits.org. Retrieved 10 June 2016. ^ Theopompus, cited by Athenaeus (12:526) around 200 BCE; according to Athenaeus (1941). The Deipnosophists. Translated by Gulick, Charles Barton. Cambridge, MA: Harvard University Press. ^ Jacoby, David (1997). 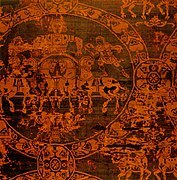 "Silk in Western Byzantium before the Fourth Crusade". Trade, Commodities, and Shipping in the Medieval Mediterranean. pp. 455 ff and notes –. ^ "Porphyrogennetos". The Oxford Dictionary of Byzantium. New York, NY & Oxford, UK: Oxford University Press. 1991. p. 1701. ISBN 0-195-04652-8. ^ Elsner, O. (1992). "Solution of the enigmas of dyeing with Tyrian purple and the Biblical tekhelet". Dyes in history and Archaeology. 10. pages 14 ff. ^ Ziderman, I.I. (1986). "Purple dye made from shellfish in antiquity". Review of Progress in Coloration. 16: 46–52. ^ a b Radwin, G. E.; D'Attilio, A. (1986). Murex shells of the world. An illustrated guide to the Muricidae. Stanford, CA: Stanford University Press. p. 93. 284 pp incl 192 figs. & 32 pls. ^ Benkendorff, Kirsten (March 1999). "Bioactive molluscan resources and their conservation: Biological and chemical studies on the egg masses of marine molluscs". University of Wollongong. Archived from the original (PDF) on 30 August 2007. Retrieved 25 February 2008. ^ Jacoby (2004). "Silk economics and cross-cultural artistic interaction: Byzantium, the Muslim world, and the Christian west". Dumbarton Oaks Papers. 58: 210, 197–240. ^ Biggam, Carole P. (March 2006). "Whelks and purple dye in Anglo-Saxon England" (PDF). The Archaeo+Malacology Group Newsletter. Glasgow, Scotland, UK: Department of English Language, University of Glasgow (9). ^ a b Moorey, Peter (1999). Ancient Mesopotamian Materials and Industries: The Archaeological Evidence. Winona Lake, Indiana: Eisenbrauns. p. 138. ISBN 1-57506-042-6. ^ Hogan, C. Michael (2 November 2007). Burnham, Andy (ed.). "Mogador: Promontory Fort". The Megalithic Portal. ^ Cooksey, Christopher J. (2001). "Tyrian purple: 6,6'-dibromoindigo and related compounds". Molecules. 6: 736–769. ^ Vitruvius. De Architectura [On Architecture]. Book VII, Chapter 13. ^ Aristotle (2004). History of Animals. Whitefish, MT: Kessering Publishing. Book V, pages 131–132. ^ Pliny the Elder (1855). "Chapter 62: The Natural History of Fishes". In Bostock, John; Riley, Henry Thomas (eds.). The Natural History. London, UK: Taylor and Francis. Book IX. Pliny discusses Tyrian purple throughout Chapters 60–65. ^ John Malalas, Chronographia II:9. ^ Stieglitz, Robert R. (1994), "The Minoan Origin of Tyrian Purple," Biblical Archaeologist, 57, 46–54. ^ Cazzella, Alberto; Moscoloni, Maurizio (1998). "Coppa Nevigata: un insediamento fortificato dell'eta del Bronzo". In Troccoli, Luciana Drago (ed.). Scavi e ricerche archeologiche dell'Università di Roma La Sapienza. pp. 178–179. ^ Jacoby (2004), p. 210. ^ Nutall, Zelia (1909). "A curious survival in Mexico of the use of the Purpura shell-fish for dyeing". In Boas, F. (ed.). Anthropological Essays Presented to Fredrick Ward Putnam in Honor of his Seventieth Birthday, by his Friends and Associates. New York, New York: G. E. Strechert & Co. p. 370. ^ Robinson, Stuart (1969). A History of Dyed Textiles. London, UK: Sudio Vista. p. 24. ^ Compton, Stephen (2010). Exodus Lost (1st ed.). Booksurge Publishing. pp. 29–33. ISBN 9781439276839. ^ "Definition of the Tyrian purple". ancient.eu. Archived from the original on 24 July 2016. ^ Friedlaender, P. (1909). "Zur Kenntnis des Farbstoffes des antiken Purpurs aus Murex brandaris" [Towards understanding the ancient purple dye from Murex brandaris]. Monatshefte für Chemie. 30: 247–253. ^ Sachs, Franz & Kempf, Richard (1903). "Über p-Halogen-o-nitrobenzaldehyde". Berichte der Deutschen Chemischen Gesellschaft. 36 (3): 3299–3303. doi:10.1002/cber.190303603113. ^ "Indigo". Encyclopædia Britannica. V (15th ed.). Chicago, IL: Encyclopædia Britannica, Inc. 1981. p. 338. ISBN 0-85229-378-X. ^ Cooksey, C.J. (2001). "Tyrian purple: 6,6'-dibromoindigo and related compounds" (PDF). Molecules. 6 (9): 736–769. doi:10.3390/60900736. ^ Wolk, Joel L; Frimer, Aryeh A (2010-08-15). "A Simple, Safe and Efficient Synthesis of Tyrian Purple (6,6′-Dibromoindigo)". Molecules. 15 (8): 5561-80. PMC 6257764. PMID 20714313. ^ John Edmonds, Tyrian or Imperial Purple: The Mystery of Imperial Purple Dyes, Historic Dye Series, no. 7 (Little Chalfont, Buckinghamshire, England: John Edwards, 2000). ^ Chenciner, Robert (2000). Madder Red: A history of luxury and trade: plant dyes and pigments in world commerce and art. Richmond: Curzon Press. p. 295. ^ Głowacki, E.D. ; et al. (2011). "Ambipolar organic field effect transistors and inverters with the natural material Tyrian purple". AIP Advances. 1. 042132. ^ Buck, G. "Buck Rose". p. 5. Archived from the original on 23 August 2006. ^ "Edward VII 2d". Postal Museum. Collection catalog. "Tyrian Purple". Ancient History Encyclopedia. Cooksey, Chris J. (1994). "Making Tyrian purple". Dyes in History and Archaeology. 13: 7–13. Source of article in author’s Bibliography page. Guckelsberger, Marianne (December 2013). Purple Murex Dye in Antiquity (PDF) (Thesis). University of Iceland. "Tyrian purple". The Free Library. "Royal Purple of Tyre" (PDF).